Home > Translating > Happy International Translation Day! 30 Sep Happy International Translation Day! 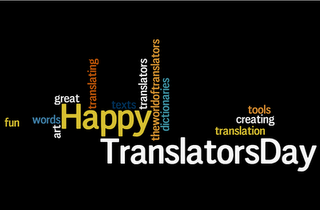 It is September 30th, which the International Federation of Translators has declared International Translation Day . Here in Iceland, translations are such an integral part of life that it would spell absolute disaster if they were suddenly removed. Just think of all the films, books, TV shows, international agreements, instruction manuals, medical instructions, news, brochures, business reports, documents used in international collaboration and more … that are translated on a daily basis. And yet, translators in this country are almost always completely invisible. I can still recall the arrogance of the Director of Programming at RÚV (State Broadcaster) many years ago when a film script that I had translated won an international award – yet my name was nowhere mentioned. When I called to ask about it, he pointedly told me that I was just a translator “úti í bæ” (i.e. “a common translator”), I’d been paid for my work, and therefore had no claim to any public credit. In other words: STOP WHINING. Another time I was at an opening of a photography exhibition at one of this country’s most eminent cultural institutions. A book of photographs was being published in conjunction with the exhibition, and I had translated the written text into English, which was substantial and appeared right next to the Icelandic text on the page. I listened to the director of the institution congratulate and thank everyone who had come near the production of the book: the photographers, the editor, the author of the text, the graphic designer, the person who had overseen the production – literally EVERYONE … except the translator. So I am very happy to have and to promote this day. Long live translators, and may their contribution be increasingly recognized in this era of globalization.